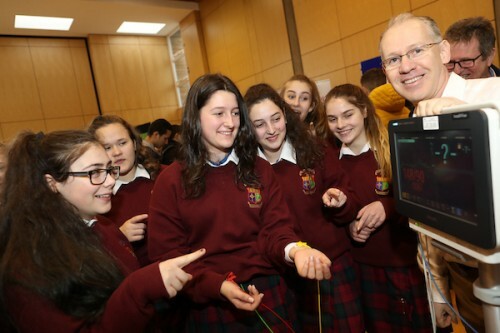 In March 2017 more than 300 Dublin 8 & Dublin 12 secondary school students attended an interactive careers day hosted by the National Paediatric Hospital Development Board, showcasing the various types of engineering and construction careers that will be available during the construction and operation of the new children’s hospital. Part of the official Engineers Week programme of events, the careers day was attended by the Minister of State for Communities and National Drugs Strategy, Catherine Byrne TD, and a wide range of engineering and building environment professions were represented which either have or will be working on the children’s hospital, including architects, quantity surveyors, electrical, civil and clinical engineers, apprenticeships, trades and CAD technicians. 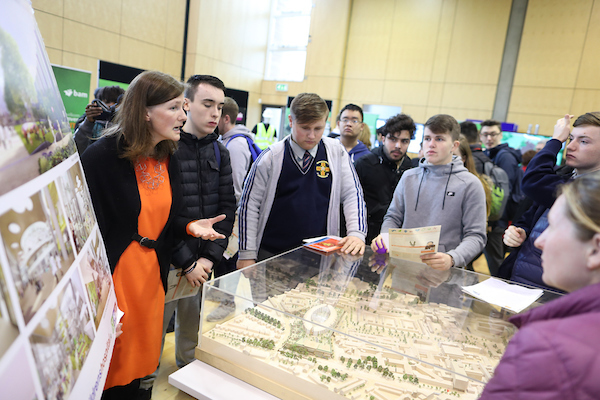 Visitors to the showcase were met by representatives from the internationally renowned design team BDP who are responsible for the beautiful hospital design, which received permission from An Bord Pleanála in April 2016 to be constructed on a campus shared with St James’s Hospital in Dublin. They were then taken along the ‘engineering and construction journey’ of the hospital meeting the various teams and professionals that will bring the seven storey hospital to life, up to and including the clinical engineers who will be responsible for the management of high-tech equipment at the hospital when it’s operational in 2021. Favourite features included Virtual Reality 3D glasses, giving students a tour of what the inside of the new hospital will look like. Students attending the NPHDB Careers day. Delivering tangible community benefit to people living near the hospital is an important remit of the new children’s hospital project. During the planning period, a Community Benefit Oversight Group was established with representatives from the City of Dublin Educational Training Boards, Dublin City Council, HSE, Tusla, Department of Social Protection, An Garda Siochana, the local community networks and partnerships, St. James’s Hospital, the Children’s Hospital Group and the National Paediatric Hospital Development Board, with the overarching objective to promote active engagement between local community interests and the hospital project so that the community benefits in terms of health, training, career opportunities and local business development. Ingrid McElroy is the Community Benefit Manager with the NPHDB. She said; “Today’s event is about demonstrating to young people the breadth of career avenues open to them in engineering and construction, from professional roles to apprentices, trades and technicians. 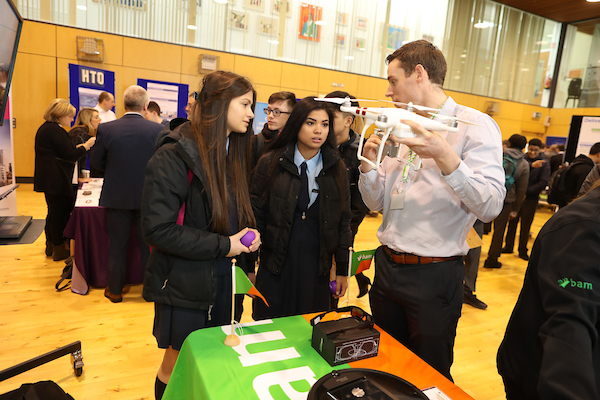 Some of the young people attending today may not be aware of what engineering is about, so we want to show this in such a way that is exciting, interactive and above all show that all these opportunities are attainable – within their reach. 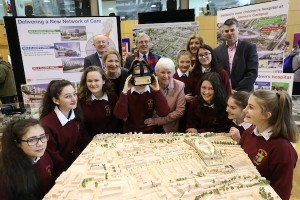 Even if they are not interested in construction or engineering – and I hope we inspire some – especially girls given the amount of women who are involved in the design and build – what we also want to achieve is a sense that this building will form part of their neighbourhood landscape and the hospital a part of their community. What I’m really hoping for is that they have a ‘hold on a minute’ moment – these people are saying yes, we want you to help us build this hospital, we want you to be our clinical engineers, nurses and doctors. And we believe you can be”. The NPHDB is one of the first projects on this scale in Ireland to include social clauses as part of its construction contacts, committing to providing job opportunities for local people. A number of local people have worked on the first phase of construction, which will be completed in the coming weeks, including Engineers Assistant Ross Burns; “I’ve already learned so much from working on this site. I always thought I would like to pursue a career in engineering and now I definitely do. I’m very grateful to be part of such an exciting project,” he said.